Spring is here, at least according to the mass media. In the mountains the story is very different as I discovered on a trip up Meall a’Bhuachaille above Glenmore in the Cairngorms. As so often I’d chosen this favourite walk because the forecast suggested stormy weather on the main Cairngorm summits (Meall a’Bhuachaille is 810 metres, some 400 metres lower). Heavy snow in Aviemore suggested maybe I wouldn’t have to go that high before conditions became difficult and so it turned out. 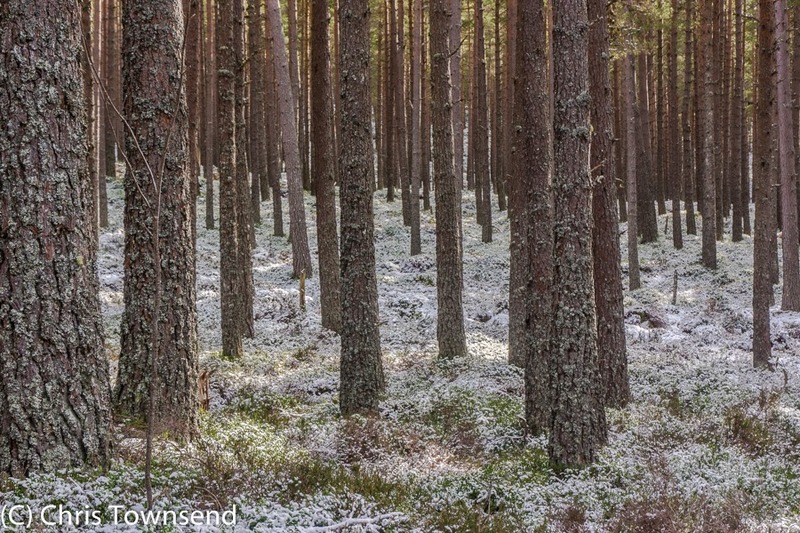 In Glenmore Forest fresh snow carpeted the woodland floor, hiding all but a few hints of green. Down here it was calm, the air crisp and cold. As soon as the trees began to thin I felt the wind though. 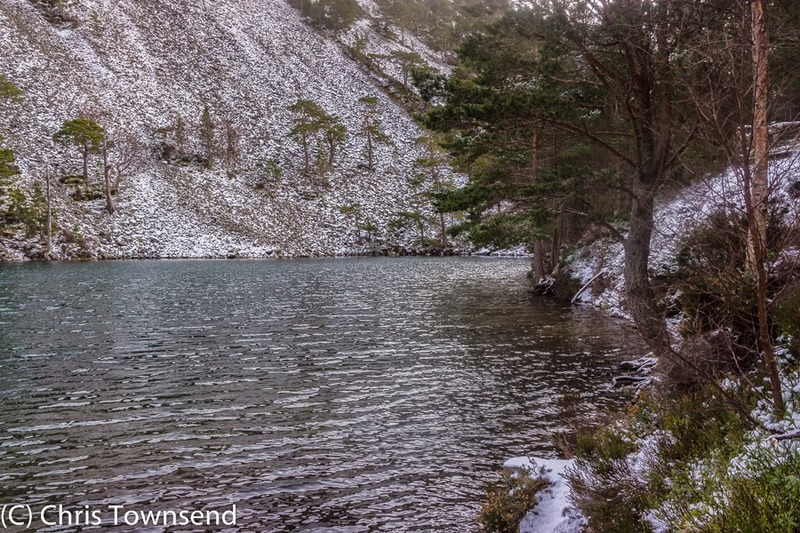 Waves rippled across dark Lochan Uaine. Above the hills clouds surged across the sky bringing flurries of snow. Once I climbed out of Ryvoan Pass and started the ascent I was being buffeted by the bitterly cold wind and only the effort of the ascent kept me warm even though I was well-clad. The path was icy and slippery, the wind having scoured away any soft snow, just leaving old hard drifts and ice glazes on the stones. Soon the gusts were moving me sideways – without trekking poles I would have been blown over. Spindrift began to whirl over me, more than head high, stinging my face. I climb Meall a’Bhuachaille several times a year and have done every year for the twenty-five years I’ve lived in this area. Probably over 100 ascents in total. Not once can I remember ever considering turning back. This time I did. Staggering along in a white whirlwind of snow with the wind threatening to send me flying with very step I began to wonder if I could reach the top. I also became aware that being knocked over could mean landing hard on rocks and stones and possibly injuring myself. I moved off the path onto the heather beside it. The snow was deeper and softer here and the deep vegetation would, I hoped, cushion any fall. Whilst my mind pondered turning back my body, ignoring my thoughts, plodded on, determined and stubborn. Eventually the summit came into view and the broken-walled windbreak round the cairn became my aim. All I wanted was to get there and hide from the wind. Reaching it I felt a surge of relief. I really was at my limits. Cowering behind the rock walls I had a snack and donned overtrousers and thicker gloves as my legs and hands were starting to feel cold. My nose had gone numb too and my cheeks stung. Reaching over the edge of the cairn I held up my anemometer. The wind was gusting between 40 and 50mph, with one blast reaching 52mph. The windchill was -14°C. Out of the wind the temperature was -2.5°C. Reluctantly I returned to fighting the wind but at least I was descending now, again sticking to the heather and soft snow. 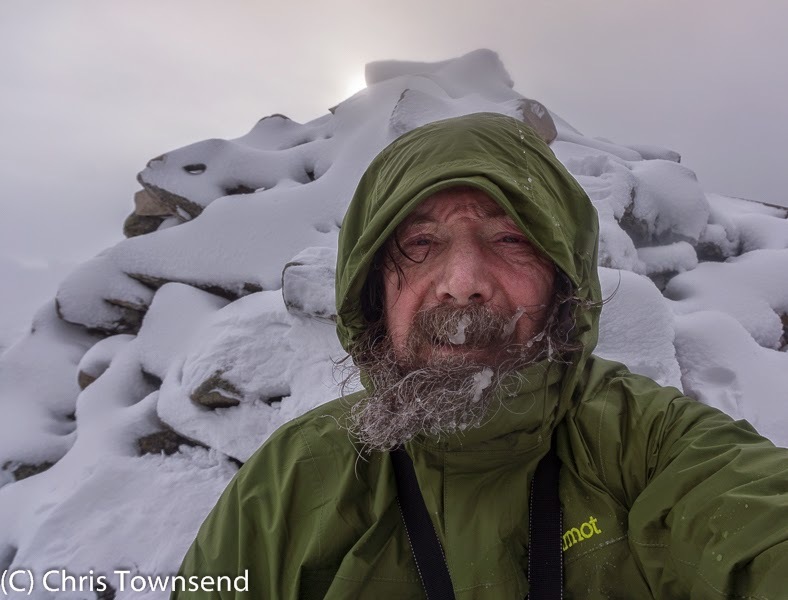 Once I’d left the main ridge – any thought of continuing to the next summit had long gone – the wind began to ease and I dropped out of the swirling mixed spindrift, snow and mist (which it was impossible to separate). 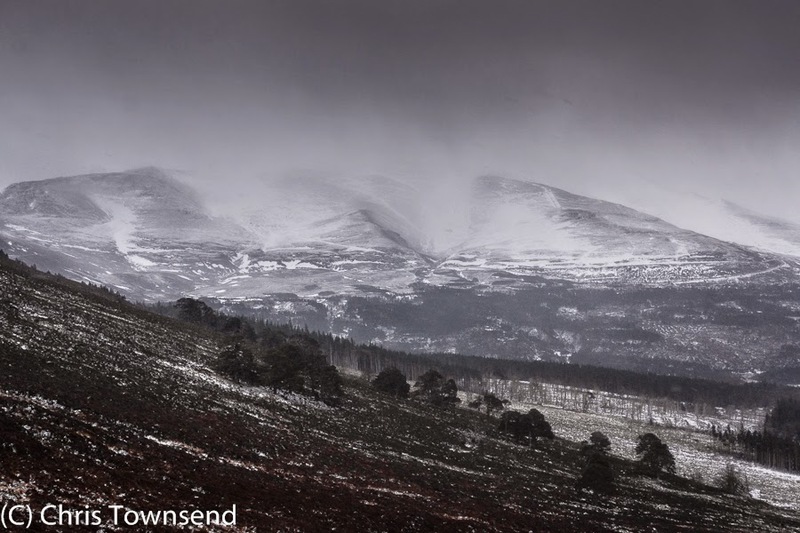 Across Glenmore the high Cairngorms were under dark clouds. 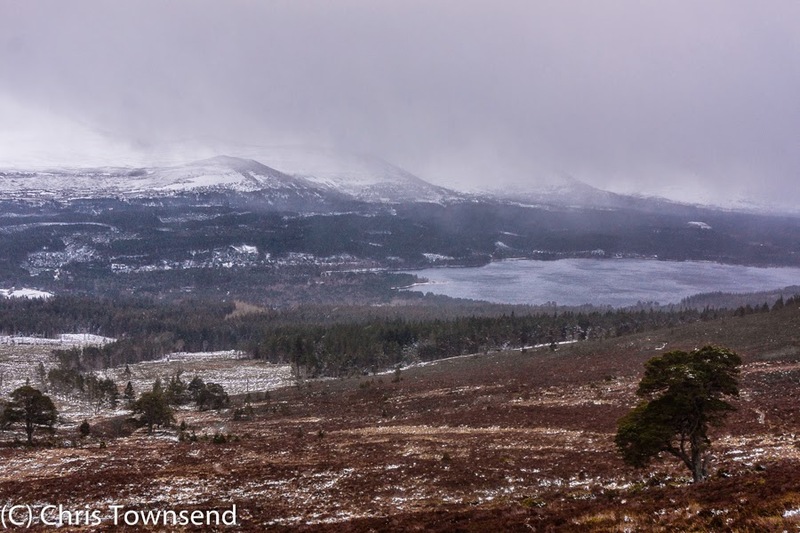 Loch Morlich was a shimmering moving mass of wind ruffled water. Reaching the forest I finally relaxed after one of the toughest days of the winter. Nice report! Glad you had the chance to make the hike.